Thanks in part to some generous "Friends of Linda," we are able to offer two types of scholarships for the 2017 Summer Art Camps. This summer, we have a pre-applied a $30 scholarship to every camp fee. The full price for a 3-day camp, all supplies included, is $149. With the $30 scholarship applied, each camp is priced at $119. In addition to the $30 scholarship, we will still honor our multi-camp discounts. See our Summer Art Camp page for more information. We currently have the funding to offer one "full" scholarship. This award will cover all but $19 of the tuition for a 3-day camp. The family will be responsible for the co-pay of $19. We are also funding two "half" scholarships. These awards will cover all but $69 of the fee, which the family will cover as a co-pay. 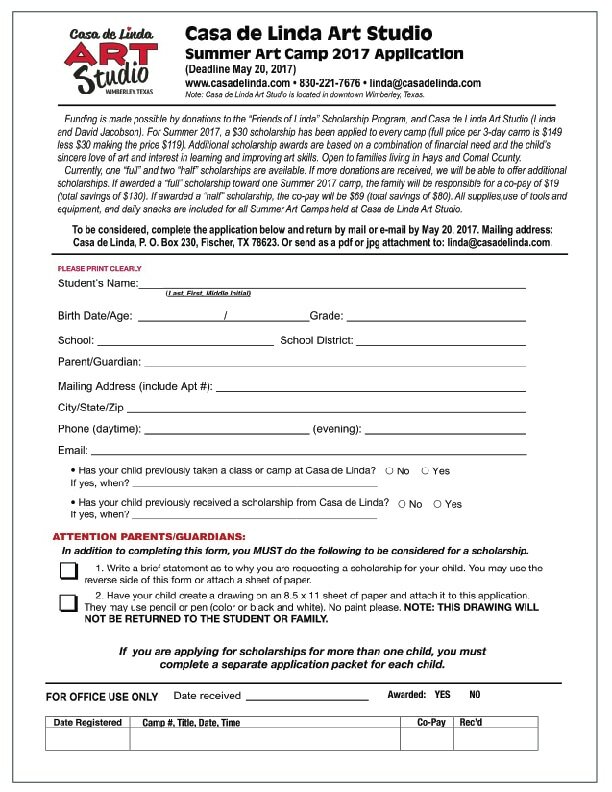 To be considered for the Special Scholarship Awards, you will need to download and complete an application. If you have any problems with the download, please email linda@casadelinda.com and request a form by email or mail. If you have any questions once you have seen the form, please contact us. Again, the program-wide $30 scholarships are already applied and there is no need to do anything to qualify. If you are in a position to donate to our "Friends of Linda" Children's Scholarship program, please visit our "Donate" page for information and a link to donate online. Thanks! Click here or on the image of the application to view and/or download as a pdf file. 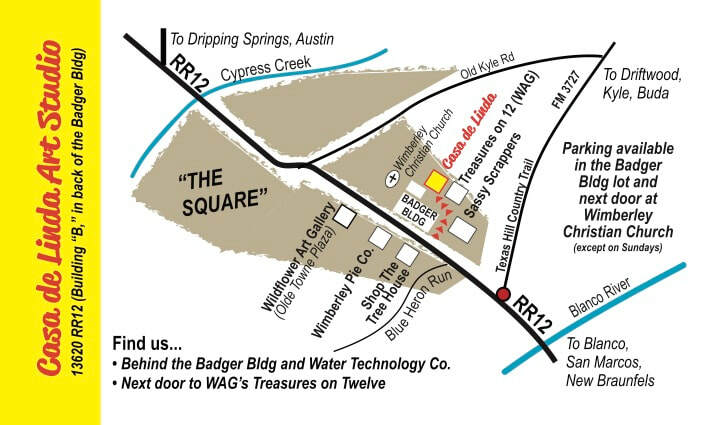 When Casa de Linda Art Studio relocated from New Braunfels to Wimberley this Spring, owner Linda Calvert Jacobson wanted to be sure that certain programs and traditions would continue at the new location. In addition to making the art camps available in Wimberley, Jacobson also wanted to ensure that another program would continue as well. “Many years ago, we were fortunate to have some individuals make donations to the art league that were earmarked toward scholarships for children who wanted to enroll in our camps but whose families could not afford to cover the full tuition,” Jacobson explained. She added that in addition to the donations, she and her husband, David would offset some of the costs themselves so that funding could benefit as many students as possible. The first and most substantial gift came from a former student, Don Staats, who studied painting with Jacobson for two years before passing away this March. “The last time I was able to visit with Don in rehab he gave me an envelope that was from him and his wife, Norma. He told me I could use the money toward scholarships or however I saw fit. While it was not a huge sum, it was enough to help us get our scholarship program up and running this summer,” she said. A few months later, Norma Staats contacted Jacobson and said that her husband also wanted to donated his art supplies to her program. This additional donation provided some of the paints and brushes that Jacobson would have otherwise needed to purchase for the summer program. “Between the cash gift from Don and a few others, and the donation of art supplies, combined with contributions from my husband and myself, we were able to launch our Summer Art Camp Scholarship Program at our new studio this year,” Jacobson said. When additional gifts are made to the program, Jacobson will be able to increase the number of scholarships that will be awarded, she said. Donations may be made through a special link on her website, http://www.casadelinda.com/donate.html or by emailing linda@casadelinda.com or calling 830-221-7676.